It’s an exciting time of year at Reptiland, the time of year we as a staff come to anticipate. This is the time that we welcome not only warm breezes and new blossoms, but also the opening of our seasonal exhibits. The planning starts earlier than you might think; before the end of 2011 was in sight, we had committed to bringing back the dinosaur exhibit. . . and making it even more impressive than before! Along with some new dinos, we will welcome back some favorites including Tyrannosaurus rex, Dilophosaurus, Euoplocephalus, our Parasaurolophus nest, and Chasmosaurus. New dinos you should keep an eye out for: an adult Parasaurolophus photo opportunity, Baryonyx, a pair of hunting Coelophysis, and a juvenile T. rex. 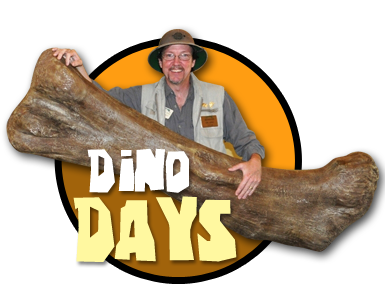 All in all, we’ll have twelve dinosaurs on display from April 28 through Labor Day. 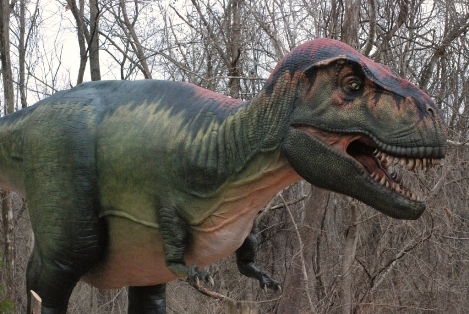 Several dinosaurs will even remain at Reptiland permanently, allowing visitors to view them year round. But that’s no t all we’ve been up to… a few months ago, we placed our annual butterfly plant order. These carefully selected plants have been raised under the special care of the gardeners at Ashcombe Farms greenhouse near Mechanicsburg. 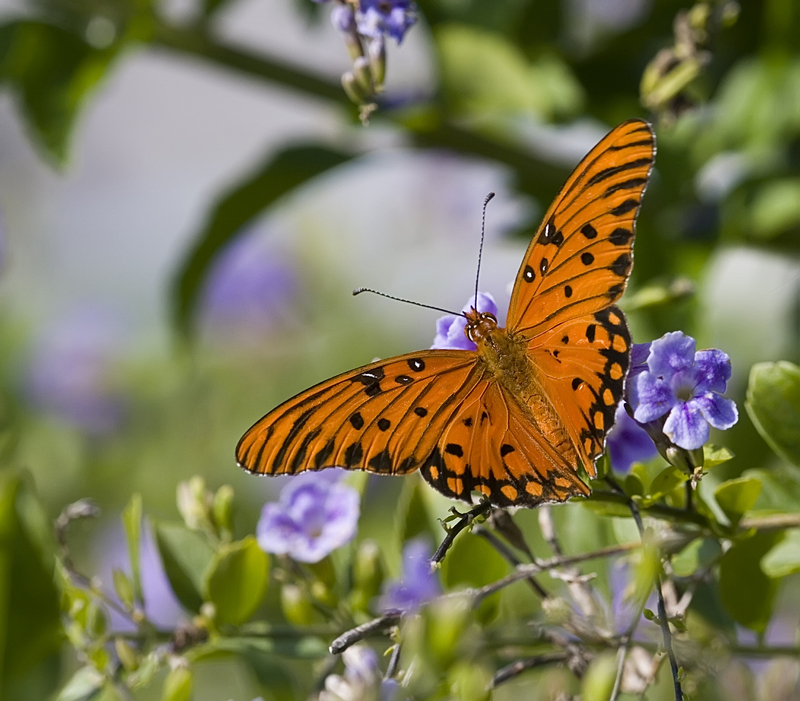 It is essential that the plants are grown free of pesticides and harmful chemicals in order to be safe for the captivating butterflies that will soon live off of their nectar. 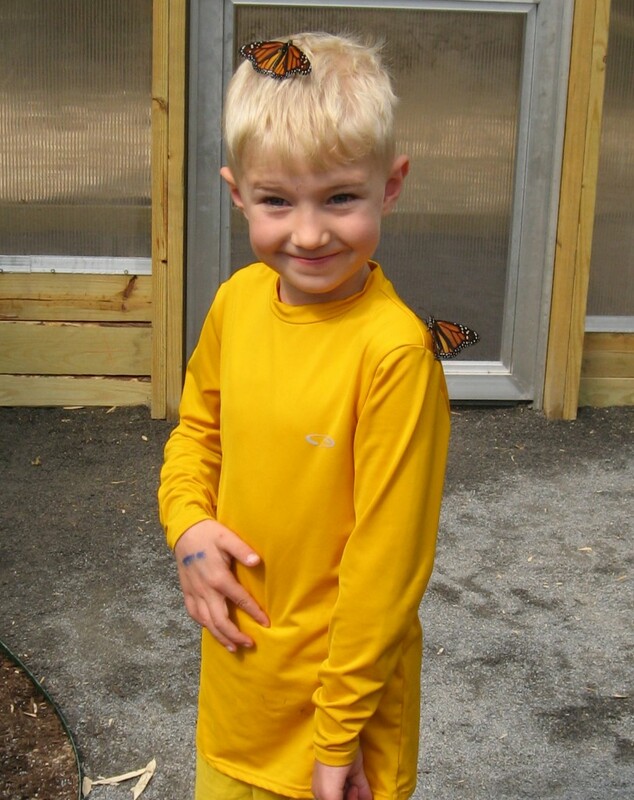 The butterfly exhibit plants were delivered, transferred and planted into our butterfly greenhouse last week. By the middle of April, we will begin receiving our first shipments of butterfly chrysalis. We work with several butterfly farms in order to exhibit many different species, all native to North America. The butterflies are sent to us in the chrysalis stage and take anywhere from 5 to 10 days to emerge into an adult butterfly. Once a butterfly emerges it will, on average, live for about two weeks. The butterfly exhibit is a very relaxing place to stroll through and has been a favorite for guests over the past several years. The butterfly exhibit, along with Dinosaurs Come to Life will be opening on April 28, 2012. Again this year, we will treat our members and exhibit sponsors to an exclusive preview night, to be held from 4-7 pm on Friday, April 27th. The exhibits open to the general public the following day, Saturday, April 28th. For many years, Clyde has taken groups to various locations around the world. The locations are primitive, full of wildlife, and exciting! This Tanzanian Safari is not just for those who have a passion for reptiles and amphibians; it is for anyone with a sense of adventure! This February, Clyde will be taking a group on an African Safari to Tanzania with an opportunity for an extended trip to Rwanda. On this excursion, you will arrive at Kilimanjaro and visit places such as Tarangire National Park which houses one of the largest elephant populations in Africa. This park may also present to you the opportunity to see lions, cheetahs, baboons, leopards, impalas, zebras, ostrich, and oryxes. Another place you’ll be visiting is the Ngorongoro Conservation Area and the Ngorongoro Crater, the world’s largest volcanic caldera. The rim is located at an altitude of 7,500-8,000 feet and your lodge is sited right on the rim. The locations you will be visiting within the crater are inhabited by thousands of flamingoes and other wildlife, giving you perfect photographic opportunities. The Serengeti is also on the list of places you will visit, and you will stop at the Ndutu area where the wildebeest migration herd spends the first part of each year. Concluding this trip will be a visit to Shanga which is a workshop for the disabled. Here the employees recycle bottles into beaded art. 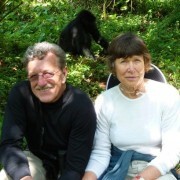 Clyde and Dianne Peeling during Clyde’s last Tanzanian trip, February 2011. For those who choose the Rwanda Extension, you will get a tour of Kigali city with a trip to the market and an opportunity for a pottery project. You will then journey through the characteristically terraced hillsides of Rwanda to the base of the Virunga volcanoes. This extension will also supply you with the chance to visit with mountain gorillas where you will track a gorilla family and spend an hour with them. You will also have an interactive experience in the village where you will learn about Rwanda traditions, culture, song, and dance. Rwanda is infamous for its genocide and war between the Hutu and Tootsie tribes in the 1990’s, so you will visit the Imbabazi Orphanage which shelters many genocide orphans and displaced children. You will also visit the Nyamata and Mtarama Genocide Memorials, and conclude your trip with breakfast on the top floor of the hotel which offers a fabulous view of the city of Kigali. For more information on the Tanzanian Safari and the trip itinerary, click here. Being a zoo keeper can be very exciting, especially when we get the chance to acquire and work with baby animals. 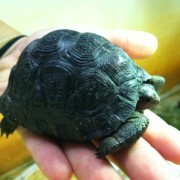 We care for these young, vulnerable critters and take part in their growth and development into mature healthy adults. 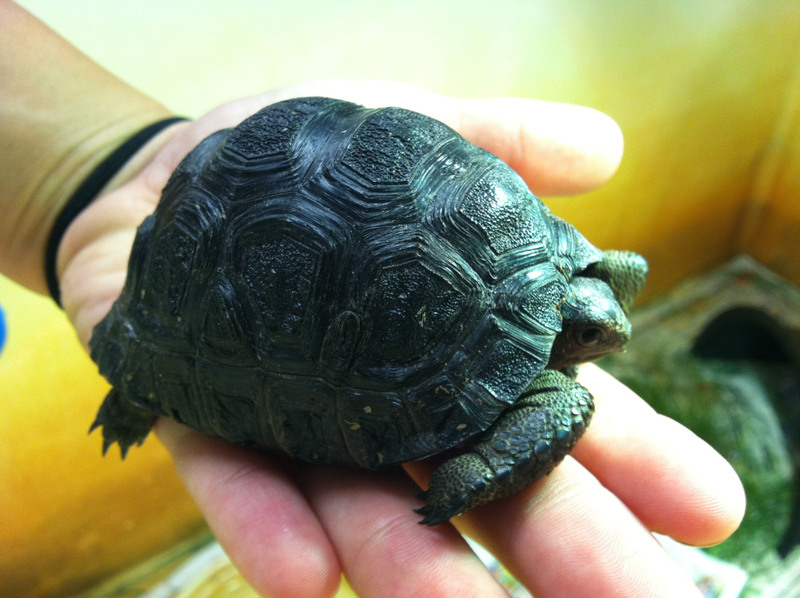 Some animals take longer than others to get to the adult stage such as the Aldabra tortoise babies that we just received from another AZA accredited institution. These two siblings were hatched in January 2011. It may be 25 years before they are considered adults of breeding age, in contrast to some snake and lizard species that can hatch and grow to breeding age in a year’s time. Until the time these young animals are big enough to be housed with our current adult Aldabra tortoises, they will be kept separate and off-display where keepers can keep a close eye on their eating habits, give them an occasional soak, and record their weights over time. Within our large collection, we are currently raising two juvenile Komodo dragons, two common boa constrictors, Aldabra tortoises, frog-eyed geckos, Malaysian leaf frogs, and numerous species of poison dart frogs. Komodo dragons are found on only a handful of Indonesian islands and are rarely exported to other countries. 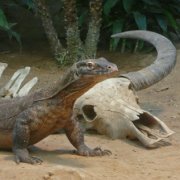 North American zoos cooperatively manage a captive population of dragons as an SSP (Species Survival Plan), but in recent years, the US population suffered the loss of many adult females and the breeding program stalled. In 2010, the Los Angeles Zoo successfully hatched a large clutch of eggs, breathing new life into the dragon population. Reptiland received two of those offspring and joined the Komodo Dragon SSP. The Peeling Productions team installing a perimeter fence around what will become the home for our Komodo dragons. We committed to building a facility to house and breed these giant lizards in Central PA, and work on a new 3,000 square foot building has begun. Komodo dragons are unlike other lizards—they are active and need lots of space. Our new facility will include a 1,300 sq ft indoor exhibit, a large indoor holding area with shift facility, and a lush outdoor exhibit for warm weather viewing. Because dragons like it hot—95 degrees everyday, year-round—the building will need to be very well insulated. With that in mind, we have incorporated a living roof into our design, a first at Reptiland. *6/14/13 Update: The Komodo dragon exhibit, Island Giants, is now open to the public! Have you ever wondered what it is like to be unable to outrun an enemy and be too small to fight? The answer for most geckos is to give up their tail. Built-in weak spots in the bones of the tail make it easy to break. 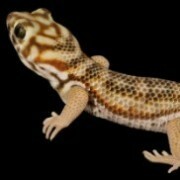 Most require a tug, but some geckos can pop off their own tail by pushing it against an object. The broken tail wriggles to distract the predator, and muscles around the break quickly seal torn blood vessels in the gecko’s body. Most geckos eventually grow a new tail supported by cartilage instead of bone. Re-generated tails are also shorter and lack the color and texture of the original. A common frog-eyed gecko (Teratoscincus scincus) who has “dropped” its tail. Another interesting adaption of geckos has is known as “Shock Shedding”. Grab the wrong gecko and you’ll find yourself holding nothing but skin! Gecko skin has two layers of dermis, creating built-in “tear zones.” The outer skin easily peels off as the gecko squirms free and the inner layer remains as a barrier against infection. Reptiland currently exhibits four species of geckos, including the giant leaf-tailed gecko, lined leaf-tailed gecko, tokay gecko, and giant day gecko. Additionally, you can create your own gecko when you pay a visit to our Build-A-Gecko interactive station! Tyrannosaurus rex, or “Tyrant Lizard”, one of the largest dinosaurs to have walked the earth, lived 70 million years ago in what is now North America. Weighing in at 7.5 tons, standing 15-20 feet tall and 40 feet long, T. rex was a fierce predator! This dinosaur’s massive jaws were lined with 50-60 serrated teeth, some measuring 9 inches long. Preserved bone and muscle fragments in T. rex feces show that it took big, bone-crushing bites consuming up to 500 lbs of meat in one bite! Its 4-foot-long jaws were big enough to swallow an adult human! See this massive meat-eater along with seven other dinosaur species at Dinosaurs Come to Life, a special outdoor exhibit at Clyde Peeling’s Reptiland. 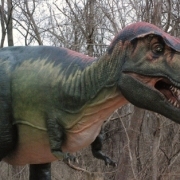 Due to its popularity, Dinosaurs Come to Life has been extended through the end of October 2011.